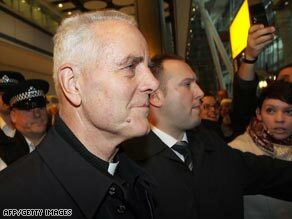 Bishop Williamson arrived in England surrounded by police and reporters. Williamson said in an interview with Swedish television that he did not believe that Nazi leader Adolf Hitler deliberately set out to murder Jews or that there were gas chambers at the Auschwitz death camp. Williamson hit the headlines partly because the pope lifted his long-standing excommunication, along with that of three other members of the ultra-conservative Society of St. Pius X, shortly after the interview was broadcast. The excommunication and its reversal were not related to Williamson's Holocaust denial. The church said Benedict was not aware of Williamson's views on the Holocaust when the excommunication was lifted, and ordered Williamson to recant. Williamson was removed as the head of the seminary he ran in Argentina after the scandal broke, and was later expelled from the country. He returned to his native Britain this week. In the Swedish interview, which was broadcast in January but apparently recorded earlier, Williamson said, "I believe that the historical evidence is strongly against -- is hugely against -- 6 million Jews having been deliberately gassed in gas chambers as a deliberate policy of Adolf Hitler. I believe there were no gas chambers." Williamson is under investigation for Holocaust denial in Germany, where it is a crime. He was in Germany when he gave the interview. The bishop's rehabilitation sparked condemnation from Israel, Jewish leaders in the U.S. and Catholic leaders in Germany, and German Chancellor Angela Merkel, among others. Williamson earlier apologized for the "distress" his remarks caused the pope. In his statement Thursday, Williamson said, ""If I had known beforehand the full harm and hurt to which they would give rise, especially to the church, but also to survivors and relatives of victims of injustice under the Third Reich, I would not have made them."